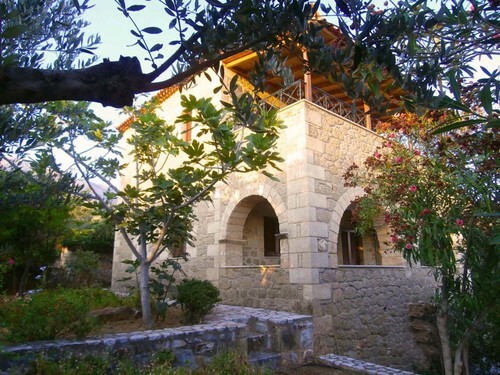 Hide away in this traditional stone house of 60-63sq.m – a garden home certain to bring roses to your cheeks. Nestled among native trees, it’s the supreme base from which to unwind. Once inside, you’ll find the open plan living space to be filled with comfortable furniture. 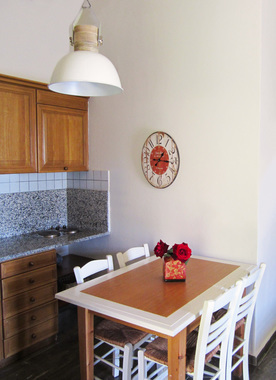 Snuggle up in the cozy couch while the dining table sits beneath the wooden kitchen. The bedroom holds two twin beds amidst simple décor, and there’s also a marble bathroom. When the sun’s shining, there’s an ample terrace outside, as well as the verdant garden – just sit back, transcend time, and absorb the Maniot charm. Be welcomed into the warm embrace of this lavish stone house of 60 -79 sq.m. The décor is as cool and traditional as you’d expect from a Maniot home; nestle into the sofa and light the fireplace on a chilly night. Rustle up supper in the simple and unpretentious kitchen, make your way over to the dining table or step outside into the enchanting shared garden where you’ll map out your next expedition. You’ve a sweet bedroom and a bright, marble bathroom. 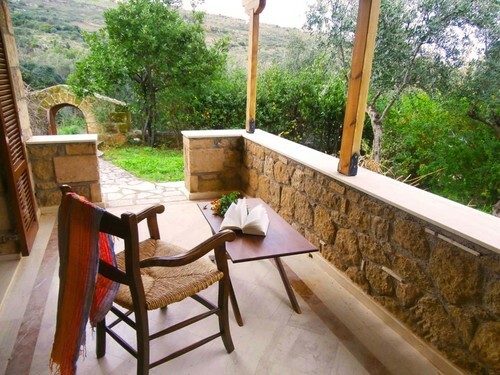 But before you slide into slumber, sidle onto the spacious veranda overlooking the sea, for a Maniot nightcap. Soothe sore eyes in this ample home of 65-80sq.m; bright and filled with sunshine, spending time here is like floating high above the clouds. The living space is open-plan, the look traditional, the materials blissfully solid. The kitchen is right behind the dining space – here you’ll find everything you need to whip upa sumptuous feast; when your meal is ready, the outdoors table will tempt you into eating alongside the bees and butterflies... There’s also a WC on the ground floor, while the top floor is given over to the bedroom and bathroom - marble and large! Behold the sweeping views from the bedroom’s balcony – serene as the bay lying beneath. If home is where the heart is, here’s where your heart will feel truly at home. 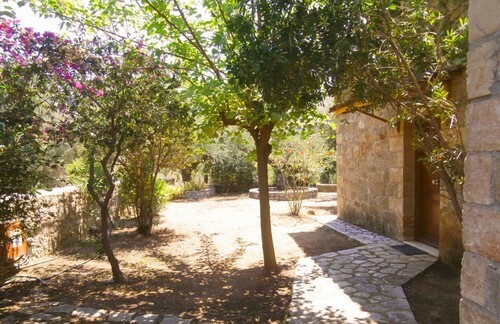 Grand, bright and full of flair, this stone house of 80-110 sq.m. is the perfect place to bring your brood. As you enter, earthy shades, splashes of sunshine and exposed stonework lend a traditional allure. With a spacious setting revolving around the stone fireplace this is the spot to lie flat and sip that glass of local wine upon the cushy sofa. The kitchen is spacious, and equipped, enough to appease all appetites – the only question is whether to dine inside, or on the terrace among the green. Outside, the garden is truly special. There’s space for the kids to run about, and for sun worshippers to express appropriate devotion. The steam of daylight which pours from the original windows reaches to the back of the home, to the bedrooms. Here, take your nightcap out beneath the starry sky before falling into delicious sleep. This is a home for dreamers, and no desire was ever left unfulfilled. 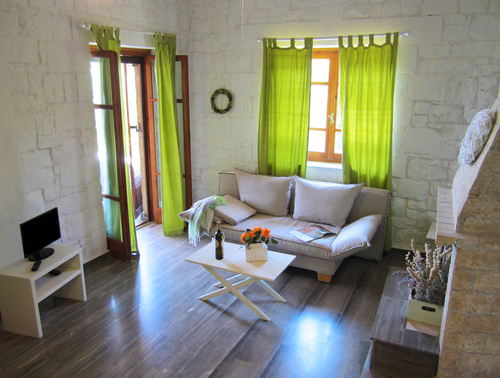 Bring the whole clan and take refuge in this 2-storey stone house of 95-110 sq.m.. Shut the doors and throw open the windows to views out across the bay. With its extra large, verdant garden, equipped kitchen and solid design, here’s a large family house that will leave you feeling utterly cosseted. You cannot help but trail your fingers across the open plan living room’s exposed stonework; the sitting area is spacious and inviting, while there’s space for the kids to run about inside. If you’re eating in, the dining room holds five, and when dinner’s done and dusted, you’ll find two large double bedrooms and a family marble bathroom (there’s also a WC on the ground floor). Once you’ve explored your surrounds, pop a bottle of local wine and make for the first floor balcony with glasses in hand; sit back and gaze across the iconic skyline.